During hot summers here in Georgia, there is no better way to cool off than jumping in the water to relax. Pools, lakes, ponds, and rivers are popular places around Atlanta to escape the heat and have a fun time. However, all of these places can be dangerous, even for experienced swimmers. Contrary to popular belief, almost all swimming pool accidents occur in shallow water. In fact, almost 80 percent of diving accidents occur in water shallower than 3.25 feet deep. While swimmers can be injured from leaping into water from staggering heights or by trying new, risky dives, most swimming and diving injuries happen in normal pools when people are doing average activities. The shape and contour of the pool has a large impact on the types of accidents that may occur. The walls of some unsymmetrical swimming pools may be more difficult for swimmers to navigate. Other pools may have reflective bottoms that trick swimmers into thinking the depth is greater than it appears. With diving accidents, the angle of impact is also very important. Even diving feet first can be risky, especially if you dive or jump from a high height. If you enter the water at a slightly “off” angle, the torque (or the force of rotation) exerted on your body can cause all kinds of injuries, ranging from spinal damage to broken bones to damage to internal organs and soft tissues. Swimming while under the influence of drugs or alcohol can also drastically increase the probability of an injury. Even some prescription or over-the-counter medicines can make it dangerous to swim. 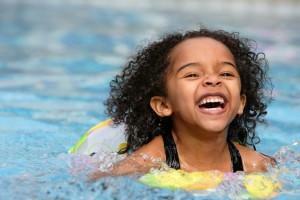 Young children and even adolescents should not swim without supervision or they risk greater injury as well. Most swimming pool accidents are just that—accidents. However, some injuries that happen at the swimming pool can be a result of another person’s negligence. For example, a pool association may be liable for injuries caused by using a diving board that is not up to grade. A lifeguard may be liable of failing to act quickly enough in the case of an injury and causing further damage. Liability will depend on the circumstances of each individual case. If you or a member of your family has been injured in a swimming pool accident, contact us at the offices of Van Sant Law,. We will analyze your case free of charge and help you determine if your case has been caused by the negligence of another person.